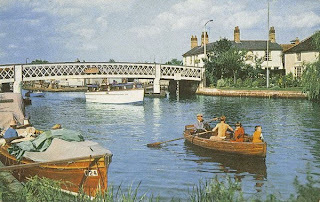 This wonderfully nostalgic picture dating from the 1960s is of Beccles on the Norfolk Broads from the lovely Broadlands Memories website. The colour palette is redolent of railway posters, Janet and John books and childhood happiness. The Home Built Boat Rally is plotting a return visit in June and I can't wait.